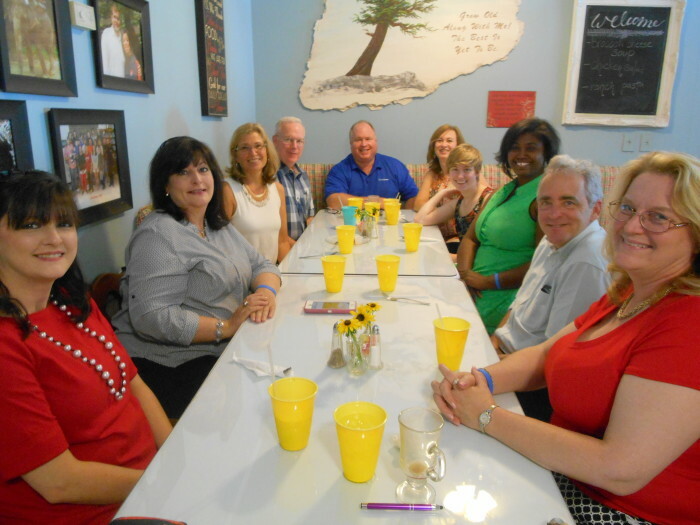 It’s fun to try out new tea rooms and go have adventures in tea! However, you do take your chances anytime you try a new place – and that’s part of the fun – but this was one of those times when our adventure went a little cattywampus. I went to Birmingham, Alabama recently and had an enjoyable visit overall. As you would expect, I had been online to see about local tea rooms and there were only two to choose from. One was the Townhouse Tea Shoppe. After leaving four messages with no return call I finally got through and found out they couldn’t take us on the day we were in town. 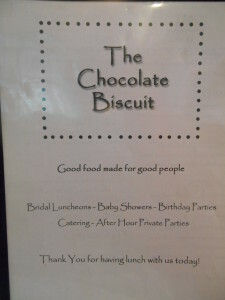 So we tried The Chocolate Biscuit in Trussville. On the plus side, they were able to accommodate our group. It falls in the category I call “Mom & Pop” tea rooms. There are some very fine Mom & Pop places but this was not one of them – as you’ll see. Some places are shabby chic. The Chocolate Biscuit is just plain shabby. The floor is pockmarked and there are a plethora of plastic chairs. They brought out this tray for my tea selection so I would guess they do serve tea regularly. 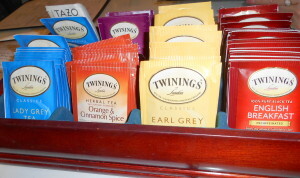 Twinings is a decent grocery store brand and the bags are convenient for the restaurant, I’m sure. Bless their hearts, this is how it was served. 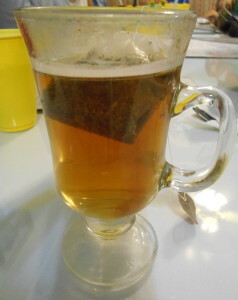 No pot, just a mug with a tea bag. The ice water was served in these bright yellow plastic cups. 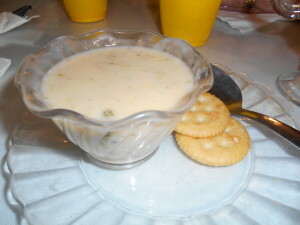 The broccoli cheese soup was thin and watery. I think they forgot the cheese. It was served along with Ritz Crackers. 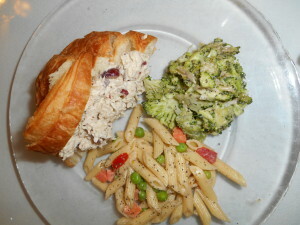 Here is the Pimiento Cheese Sandwich on white wheat bread and Chicken Salad on Croissant with two sides. I’m not sure what made the ranch pasta salad “ranch.” It didn’t have any discernible ranch dressing or spices. 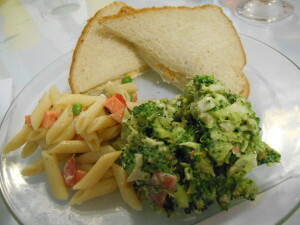 The vegetables in the pasta salad were oddly uniform and tasteless. Almost like plastic toy food. The broccoli salad was bland too. I also tried the restaurant’s namesake, the Chocolate Biscuit, for dessert. 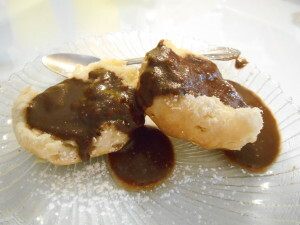 It was a buttered biscuit topped with a grainy chocolate syrup. It wasn’t worth the calories. Overall the food was average at best. Truth be told, it was as dull as the tax code. The decor would’ve been appropriate for a trailer park laundromat. 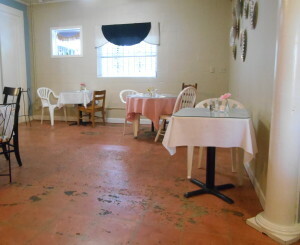 I appreciate the difficulty of running a restaurant but I believe if they stopped serving store-bought items, got rid of the plastic cups and fixed up the floor that would be a good start for much-needed improvements. I don’t believe I’ll go back and I recommend you skip this place too. There are plenty of good restaurants in Birmingham. They just won’t serve afternoon tea. The best part of any outing is the people you share it with. The company was exceptional! And they were good sports. That’s when you know you have really good friends.